As a business owner, you want to grow your business and maximize your profits. 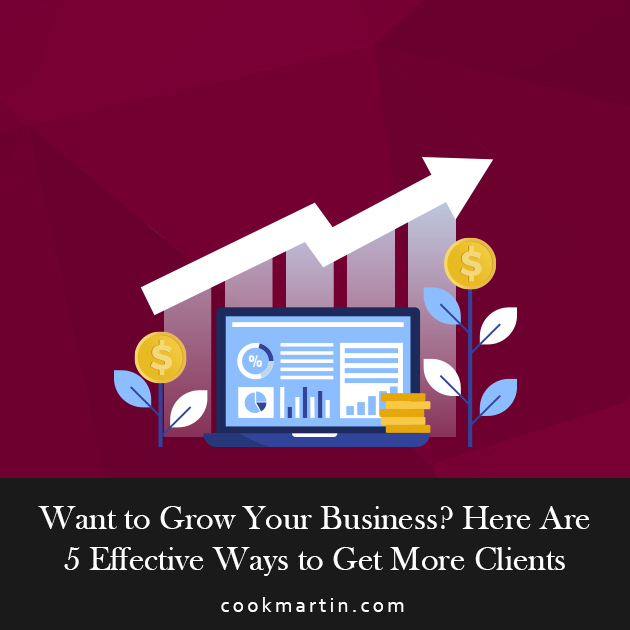 You’ve probably heard the statistic that says that it’s as much as 10 times more expensive to attract a new client as it is to keep an existing one. It’s true – but it’s also, at best, an incomplete way of looking at things. As the owner of Titan Web Agency, one of the things I do is to help my clients attract new clients. Some methods are more effective – and less expensive – than others. Here are five ways to get more clients without overspending on marketing. When was the last time your website was updated? For a lot of businesses, a website redesign is something that gets put on the back burner in favor of short-term marketing solutions like ads and social media. Those things have their value, but your website is the center of your online presence and it needs some attention. If your website has been updated in the past year or so, you are probably fine. What you can see from this is that there are business, technical, and aesthetic reasons to update your website regularly. From a business perspective, having a website that looks old or dated might be discouraging to potential clients. If your branding isn’t consistent, it will dilute your web presence and make it difficult for people to recognize your brand. The technical aspects of web design play a big role in how people respond to your site. If the site is slow to load, confusing to navigate, or not mobile responsive, visitors are far more likely to navigate away and look for something that’s more to their liking. Aesthetically speaking, your site should look modern and authentic. If you’re using old stock photos or have an outdated or tired-looking theme, it can impact visitors on both a conscious and a subconscious level. A potential client might not be aware that your website played a role in their decision to choose one of your competitors over you, but do you want to leave it to chance? The good news is that web redesign doesn’t need to be prohibitively expensive – nor do you need a lot of technical know-how to do it. Heck, you can even get started yourself if you want. Wix and Weebly allow you to build a site by yourself. While this isn't a long term solution, they are better than nothing, and if you are on a bare bones budget, then they can bridge the gap until you can have your website professionally designed and developed. If you’re not, it’s a virtual guarantee that you’re missing out on attracting new customers who are on the hunt for businesses like yours. Search engine optimization is the science of making it easy for Google and other search engines to crawl and index your website properly. In the past, the focus was on industry-specific keywords that would help potential clients find your site. Today, there’s been a shift to local SEO, which focuses on helping clients in your area using local search. Local SEO has a lot in common with typical SEO, but there are some specific factors that you should know about. Use short, descriptive url's. Going back to the dentist example, url's should be properly organized and short such as: dentistname.com/service/teeth-whitening . A url such as this is sweet, short, descriptive, and to the point. Claim your online listings. Google My Business and Bing Places for Business both offer local SEO advantages, including the ability to (literally) put your business on the map for potential clients. Create local content. Your website should have content that’s geared toward local customers. Putting a little focus on the community where you do business can help people find your website and show that you’re a valued part of the community. Standardize your NAP listings. Most businesses appear in many online directories, including both local business directories and industry-specific ones. Conduct a complete review of your listings and make sure that your business name, address, and phone number (that’s the NAP listing) are identical. Even a small difference, like using Ave instead of Avenue, can dilute your web presence. Focusing on local SEO can make a huge difference in the amount and quality of your web traffic. Bill Gates once said, “Content is king.” He said those words over a decade ago and they have proven to be remarkably prescient. Content marketing is one of the most effective ways to attract new clients. The key is to understand what works, and then to create the kind of content that will be appealing to your target audience. You’ll also need to strike the right tone. That means avoiding industry jargon if your audience won’t recognize or use it. A company that caters directly to consumers may be able to adopt a casual or playful tone in some circumstances. Companies that sell business-to-business should consider a more formal tone that demonstrates authority and expertise. When I work with my clients to develop a content marketing strategy, I tell them that their focus should be on value. You want the content you create to provide immediate and obvious benefits to the people who read it or view it. A good example of content marketing for an orthodontic practice might be an explanation of the best age to get your child fitted for braces or an article explaining the different types of braces that are available. When you post content to your social media pages, you’ll need to analyze your past engagement to determine what kind of content gets the most engagement. If you find that videos get 10 times the engagement of written content, then you can reallocate marketing funds to allow you to make more videos – and so on. Ultimately, the goal is to get the biggest possible return on every piece of content you create and post. What do your review pages look like? If you’re not regularly checking in to see how your business is being reviewed online, then you’re missing a huge opportunity to both keep existing clients and attract new ones. How and when you respond to positive and negative reviews can have a big impact on the number of new clients you attract. Did you know that more than 80% of online consumers say they read reviews before patronizing a local business? That’s a number that you can’t afford to ignore. Here are some simple steps to follow to make sure that your online reviews are helping you, not hurting you. Do a search for online reviews of your business and claim your listing on every review site where you appear. Then, make sure that your NAP listing is correct and update your business information so it’s an accurate reflection of your brand. Respond to positive reviews with thanks and appreciation. Positive reviews don’t require a long response, but your clients will appreciate it if you answer them briefly. Having a thankful attitude for good reviews shows that you don’t take your clients for granted. Respond to negative reviews with humility and a can-do attitude. If your response to a negative review is defensive or dismissive, you run the risk of driving away existing clients and discouraging new ones. Ignoring them is just as bad. Instead, post a quick response encouraging the reviewer to contact you directly to resolve the problem. If it’s something quick that can be resolved in your response, do so. Then, follow up – and with any luck, the reviewer will update their review to reflect your response. Encourage new and existing clients to leave reviews for you online. You can accomplish this by putting links to your review pages on your website. You may also want to collect testimonials to feature on your website or social media pages. Claiming your review listings and taking a proactive approach to responding to positive and negative reviews can help reassure potential clients and make it easy for them to choose you over your competitors. When was the last time one of your existing clients referred a new client to you? If you need to think about the answer to that question, then it’s time to set up a formal program to encourage and reward referrals. Think of a referral program as part of your marketing strategy. Just as online reviews are important to consumers, so are recommendations from people they know personally. How many times have you asked a family member or friend to recommend a local business? A referral program will allow you to capitalize on those recommendations by incentivizing your existing clients to mention your business to the people they know. Set goals for your program. How many referrals do you want to get? Are there other things you want from the referral program? For example, you might want to increase client loyalty, build brand recognition, and so on. Define your referral message. How do you want clients to make referrals? Is there a specific protocol you want to follow? It may be helpful to put your referral guidelines in writing, either on your website or in a flyer or handout that your current clients can pick up in your office. It may also help to create a dedicated landing page for referrals, particularly if you want people to post about your business on social media. Choose an incentive for referrals. It’s important to reward your clients for referrals. You may choose to offer them a discount or special product as a reward. Or, you may choose to amplify the service they already buy from you by giving them a free month or an extra benefit. Track your results. The only way to know if your referral program is working as intended is to track your results. Setting up a dedicated landing page or phone line for referrals can help. The analytics of your campaign can help you refine your methods and incentives as you go. A referral program can help you get new, qualified leads and clients without spending much money. Attracting new clients is one of the key factors of business growth. And, while marketing can be expensive, the five strategies identified here can help you maximize the number of leads you attract without blowing through your marketing budget in the process.